Scottish haulier Woody’s Express has hailed Asset Alliance’s flexible approach to contract hire, excellent customer service and quick delivery times, following delivery of three new DAF 6×2 tractor units and five new Montracon tri-axle trailers on a three-year, full-service agreement. “This is the first time we have worked with Asset Alliance and we’ve been really impressed by the quality of service they deliver. 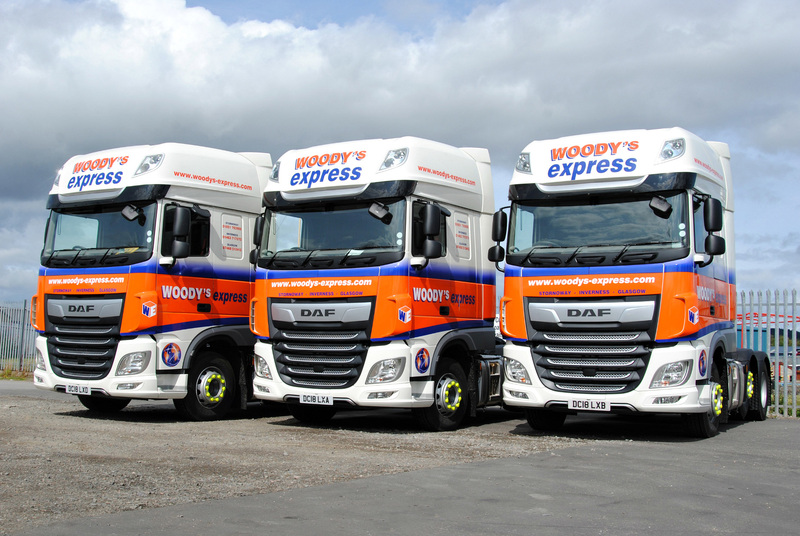 Being able to source new vehicles and have them on the road swiftly is important to us; and Asset Alliance’s ability to tailor a full contract hire solution around our precise fleet requirements was a real benefit,” said Owner of Woody’s Express, David Wood. The Isle of Lewis-based firm found the rapid sourcing of replacement vehicles and trailers, combined with the versatile financing options offered by Asset Alliance – a specialist in commercial vehicle contract hire, finance, rental and leasing – allowed for a seamless transition between old and new assets. Each of the DAF XF tractors – the reigning International Truck of the Year 2018 – benefit from the premium Super Space Cab and have been liveried in the company’s distinctive blue, orange and white colours. Together with the five trailers, they will run from depots in Stornoway, Inverness and Uddingston on the outskirts of Glasgow. The new assets will be part of the trunking service that carries out daily runs between the three sites, delivering anything from packages, parcels and pallets to furniture and domestic appliances. Under the full-service contract hire agreement, Asset Alliance will retain ownership of the new vehicles and trailers, while undertaking all safety inspections, maintenance, servicing and repair requirements. The contract also includes comprehensive roadside assistance and tyre cover. Wood has been so impressed with the ease of structuring the deal, the convenience of a fixed monthly payment plan and the full-service support package, he expects to contract hire further vehicles via Asset Alliance in the near future. At the end of the agreement Woody’s Express will simply return the vehicles to Asset Alliance, avoiding any of the hassles normally associated with disposing of used trucks and trailers.